My siblings and I are fortunate that our mother made stuffed animals for us when we were young - it made the toys extra special. 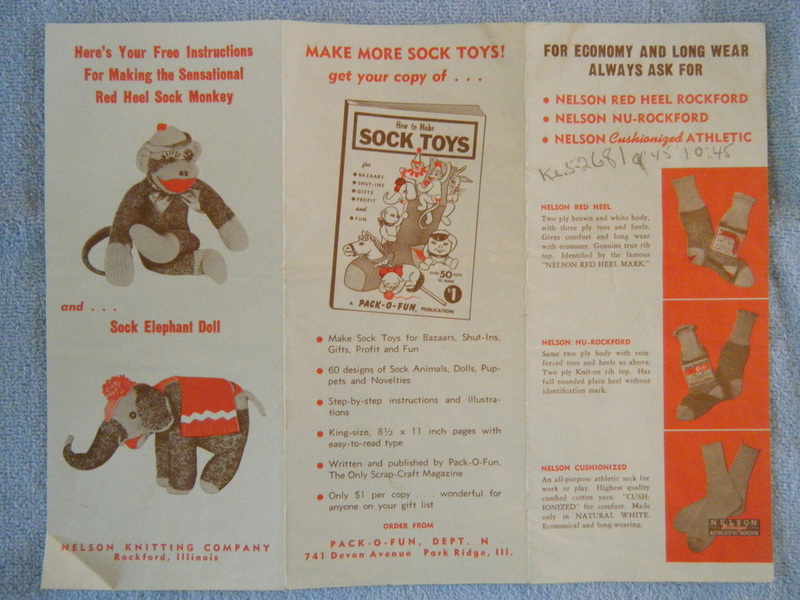 She used red heeled socks to make Humpty Dumptys, clowns, and my personal favorite - sock monkeys. She used written instructions to make the clowns and monkeys, but I believe the Humpty Dumptys are her own design - possibly made from pieces leftover from cutting out clowns and monkeys. The Humptys were shaped like thick horse shoes with spindly arms about half way between the top of the head and the bottom of the feet. We would wind up the Humptys' by their arms and then spin them like Yop-yops. I'm pretty sure my mother never envisioned her creations being used in that undignified manner. 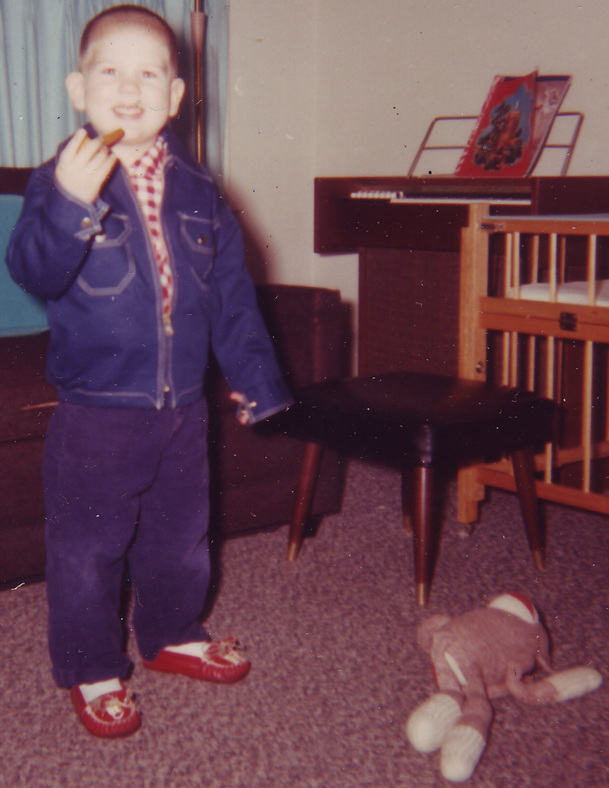 The clowns were used more for display than play, but my sock monkey (Kee-kee) was my best buddy - much like the relationship between Christopher Robin and Winnie-the-Pooh. The monkeys had long arms, legs, and best of all - a long thin tail. This marvelous set of appendages allowed the monkey to be wrapped around lots of different objects or twirled around like a throwing hammer. The monkey's body was soft and conducive to becoming an impromptu pillow. The tail was the perfect diameter for small hands to clasp while sucking a thumb. Drooling and thumb-sucking made the tails sodden. My older siblings claim that I used to try to stick the wet tail in their ears. A well worn monkey developed its own comforting "aroma". I played with my sock monkey so much that it wore out and my sister gave me her monkey as a replacement. 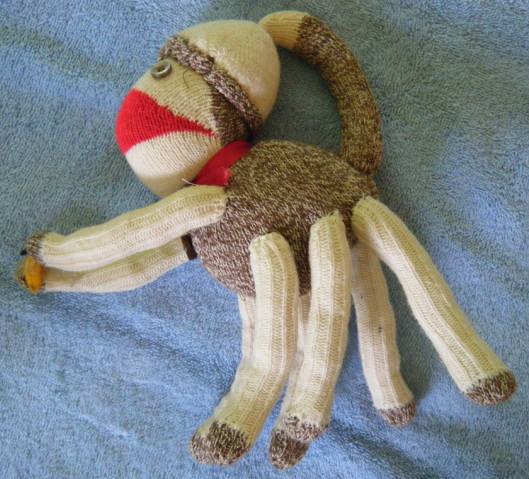 My original monkey, and its replacement, didn't survive the ravages of play and time. One Christmas, when I was in college, my mother surprised me with a replacement that she dubbed "Son of Kee-kee". In the following years I received "Grandpa Kee-kee" and "Grandson of Kee-kee". 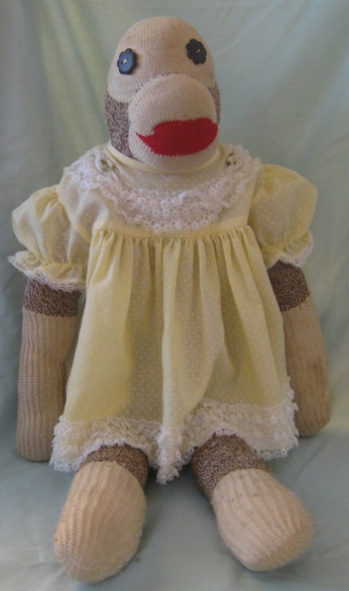 When I got married and started having children of my own, I made a sock monkey for each child. My oldest son, named his "Apey" (pronounced "A Pea") because I never got around to putting a tail on it. His very logical preschool explanation for the name was that monkeys have tails and apes do not. He wore it out taking it on all sorts of adventures. It would not be unusual to be sitting in the dining room preparing breakfast and look up to see a monkey being lowered down the stairwell on a piece of string to scope out the menu. On other occasions he would appear in suits of armor artfully constructed from cardboard and tape. Apey almost caused a tragedy when my son left him leaning against his night light. The smell of burning monkey alerted us to the situation before things got worse than a scorched sock monkey. Eventually Apey took to routinely wearing one of my son's first outfits - a red and gray striped onesie. 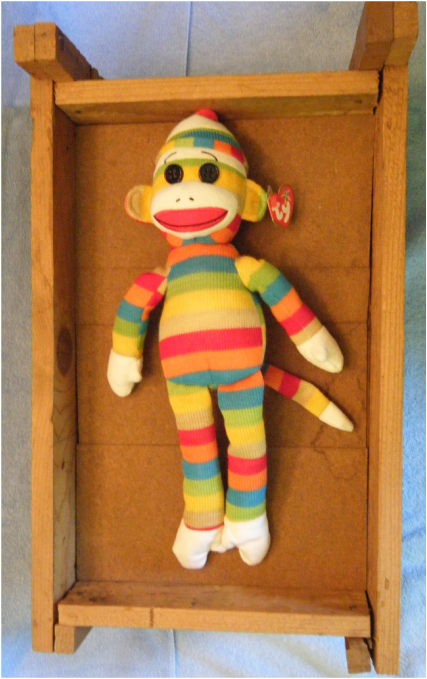 Apey, after many repairs, has retired to one of my son's boxes of stored artifacts. Hopefully, one day my son will open the box and be reunited with his old friend and together they will relive the memories that they shared. 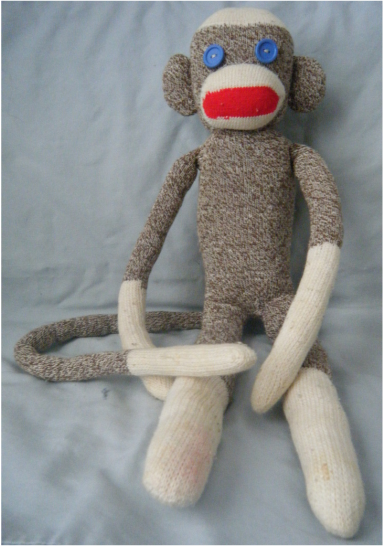 My daughter also received a home-made sock monkey so that she could play with her brother. She spent a great deal of time picking out the button eyes. She chose eyes that were shaped like flowers. She decided to name her sock monkey "Sister Apey". Sister Apey was prone to wearing my daughter's outgrown yellow dress but also dressed up in cardboard armor to go on adventures. My youngest son participated in the construction of his monkey but lost interest in it before it was even finished. It quickly took up residence in his tub of unused stuffed animals. He is definitely a member of the digital generation. He has always connected with characters in video games and loves to construct his own avatars to take on virtual adventures. Here is a photo of me with Kee-kee at the age of 26 months. My mother's caption says that I carry Keykey everywhere. (Apparently we don't agree on the spelling of the name). Here I am holding Kee-kee's tail at the age of 1 1/2 years. 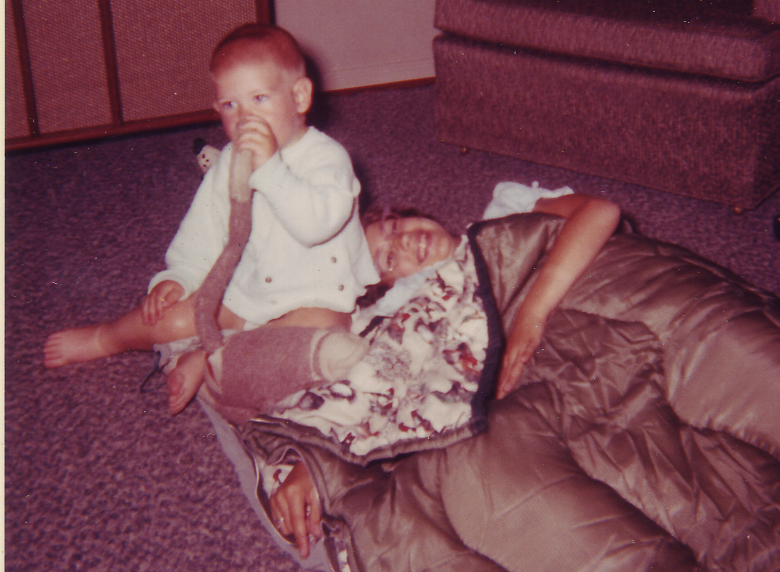 The other person is my 10 1/2 year old sister testing her new sleeping bag before going off to summer camp. 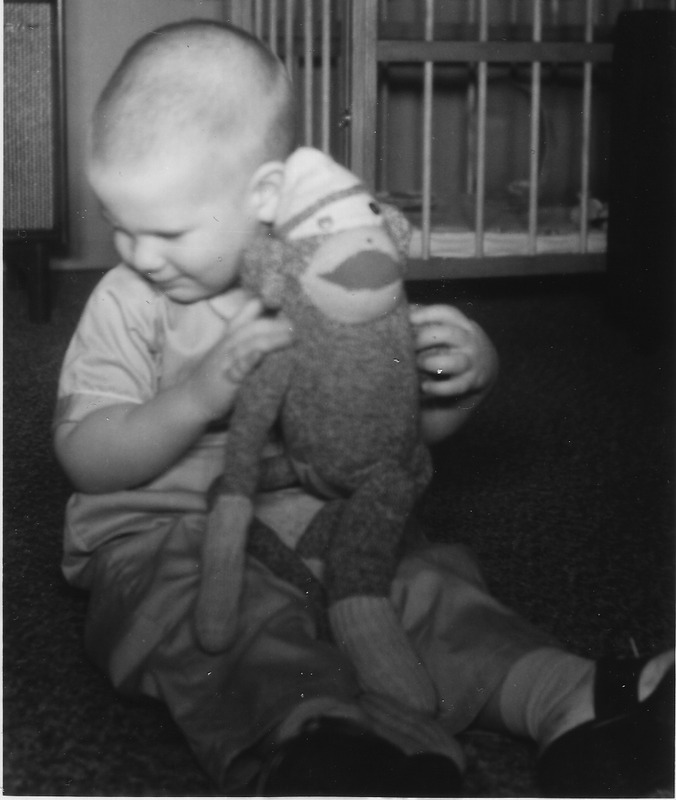 Who would have guessed that 50 years later we would be rescuing dolls and writing tales about sock monkey tails? I'm 2 in this photo. 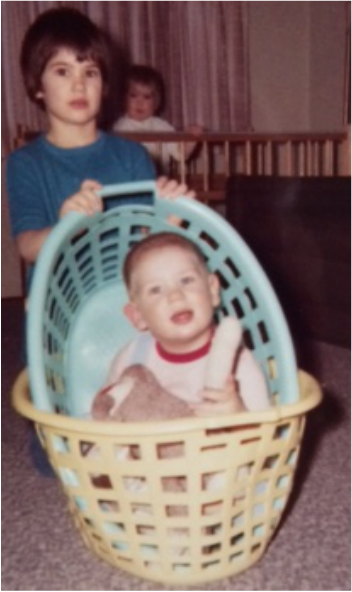 My older sister is pushing me around in a buggy we constructed from laundry baskets. This is the sister who donated her sock monkey to me when mine wore out. My family tried to capitalize on my fascination with toy monkeys by giving me "Jocko" on the Christmas before my 2nd birthday. He was plush but pretty stiff with the exception of his rubbery hands, feet, and face. 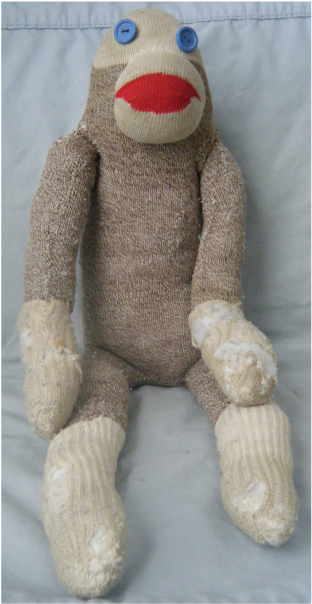 I think his seams opened up spilling out the nasty stuffing used in those days. I don't know what became of him - he may have run off to join a circus or perhaps was donated. I received "Son of Kee-kee" as a surprise Christmas gift when I was in college. 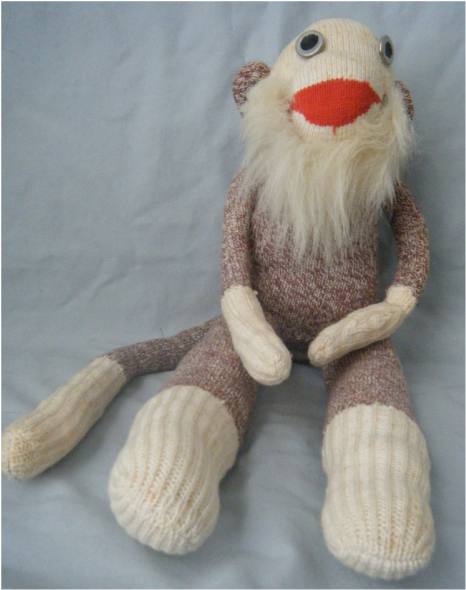 My mother outdid herself when she made this micro-sized sock monkey dubbed "Grandson of Kee-kee". This is my oldest son's tail-less Apey. He has been repaired countless times but has become so worn that the fabric can't be stitched. 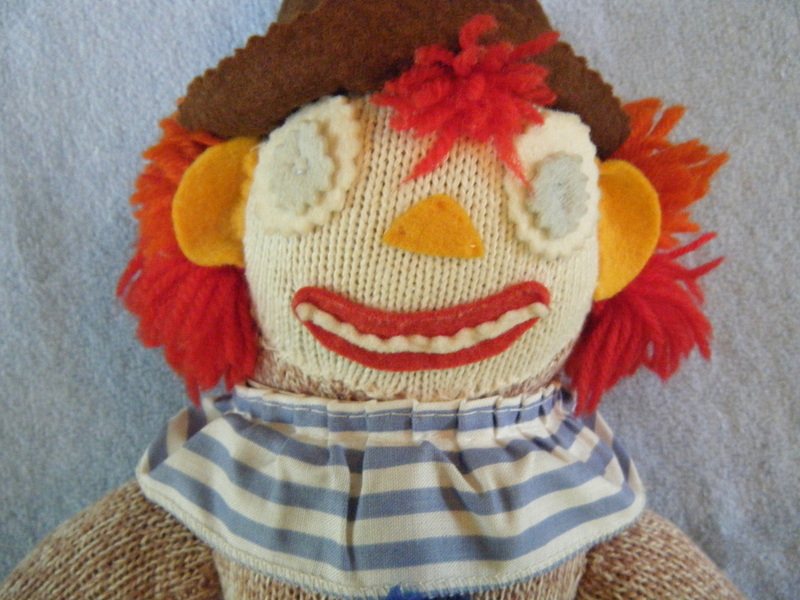 This toy exudes so much personality that he feels like a real live member of the family. 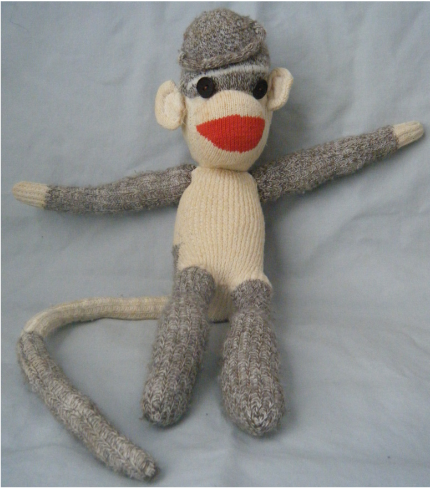 My youngest son's nearly pristine sock monkey that we worked on together. He wanted eyes that matched his brother's sock monkey. I felt compelled to put a tail on this one. This is Grandpa Kee-kee. He originally had wire rimmed spectacles but they were lost over the years. 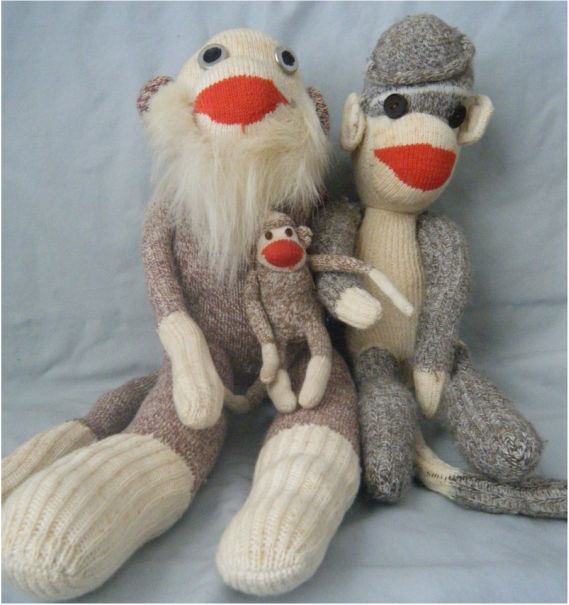 A family portrait of the sock monkeys that my mother made for me. The only monkey missing is my original Kee-kee (and my sister's donated replacement). My daughter received Sister Ape. 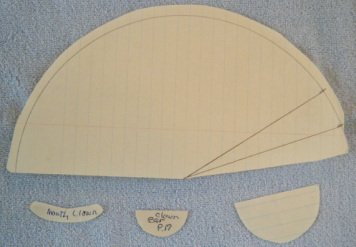 The cap, ears, neck string, and tail were left off to match Apey. The yellow dress is what she wore when she wasn't rough-housing with Apey. 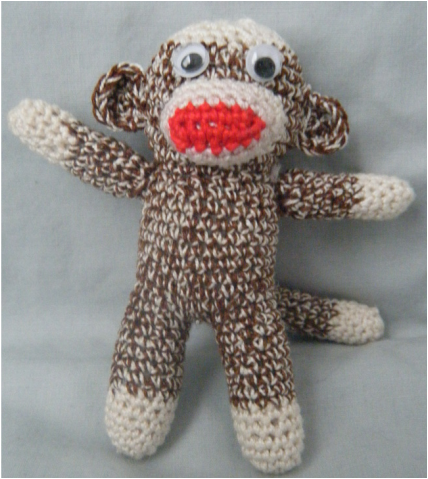 Nearly 50 years after receiving my first sock monkey, I crocheted one from thread. In real-life, he is about the 3 inches tall. 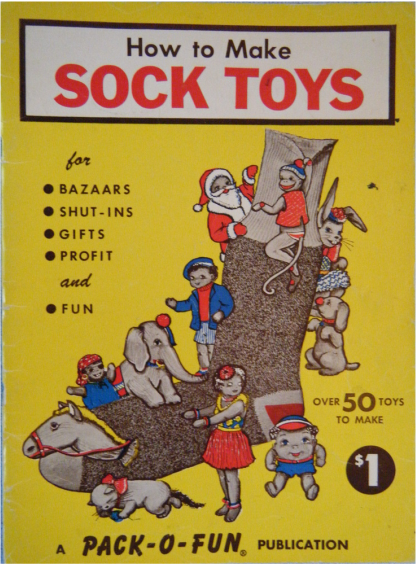 This booklet is like the encyclopedia of sock creations. My mother kept this in our craft cabinet and I used to look through it for ideas. My sock toys never came out looking like the art work in the booklet. This three-fold pattern pamphlet came with the packages of red heeled socks. 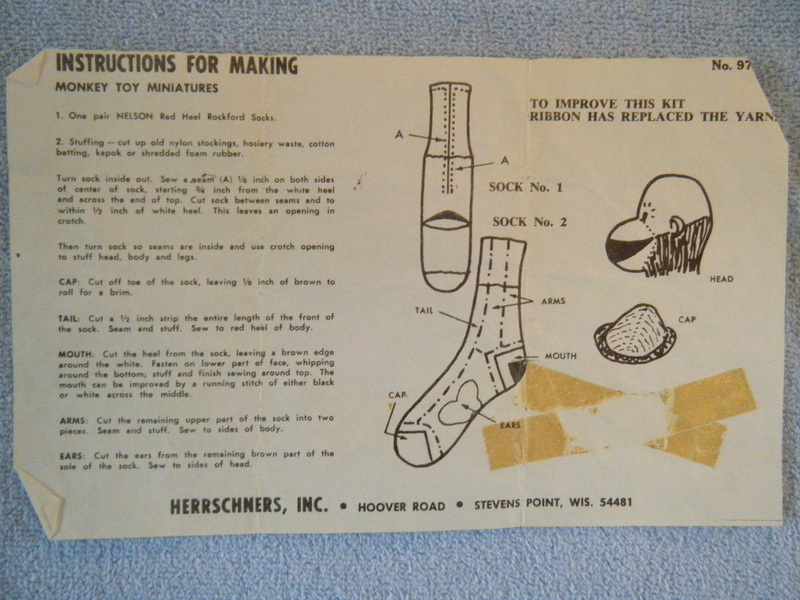 I found these templates (made by my mother) between the pages of "How to Make Sock Toys" so I know the clowns came from this publication. 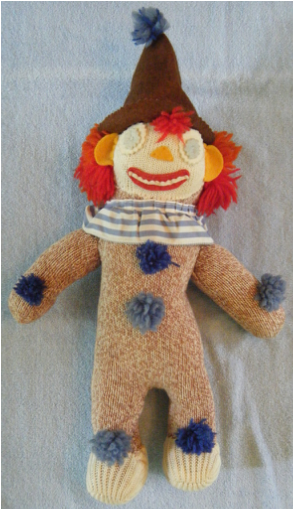 My sister's original sock clown in almost perfect condition. The drawstring that gave definition to the clown's neck is gone. Apparently my sister twisted it around her finger and cut off her circulation. I guess it came down to making a choice between saving the finger or the drawstring. I think one of the reasons I didn't want to play with the clowns is that their facial features were cut using pinking shears. The eyes reminded me of table saw blades - a tool we were never to go near. We sort of broke that rule whenever we absconded with the "saw blanket" to build forts and tents from card tables and sofa cushions. My older sister still has one of my mother's original Humptys. Its arms are about 1/2 the length of what our Yop-yop Humptys would have been. 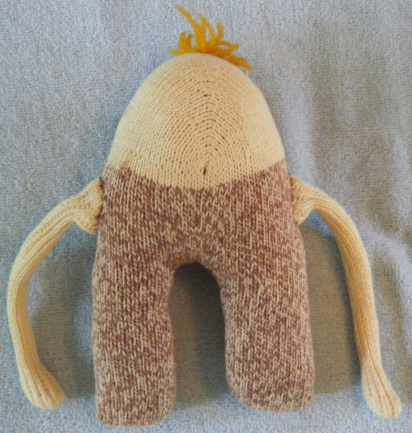 This Humpty pattern is not the one in "How to Make Sock Toys". The back of the Humpty is not decorated. 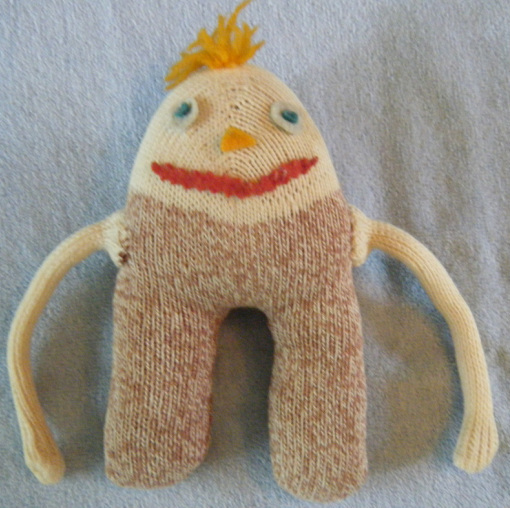 My younger sister had another type of fabric Humpty that had a face on each side. One side was the "happy face" from before the fall and the other side was the "cracked, crying face" from after the fall. My youngest sister asked for a spider monkey for a Christmas present. 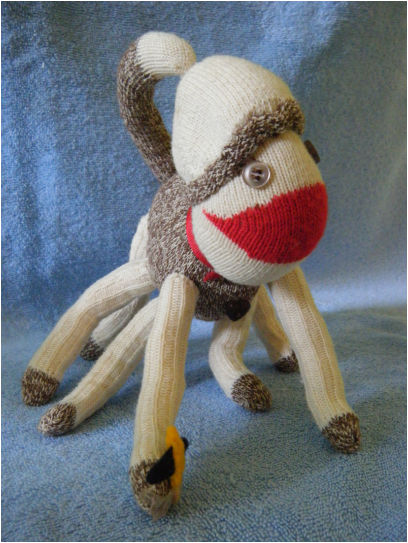 Obviously that wasn't going to happen so my mother got creative and came up with a chimera that was part spider and part sock monkey. Another view of my mother's creative "spider monkey". It is holding its favorite food - a cross between a banana and a fly. 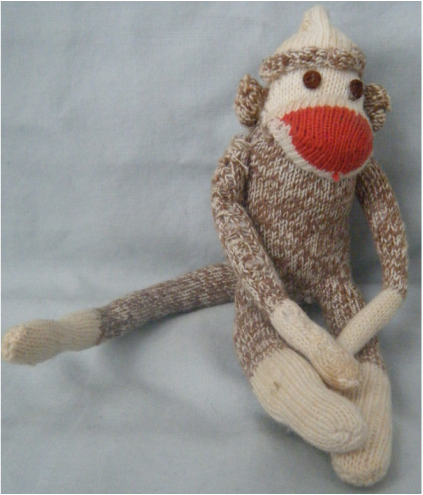 My older brother must have had the very first sock monkey in the family. 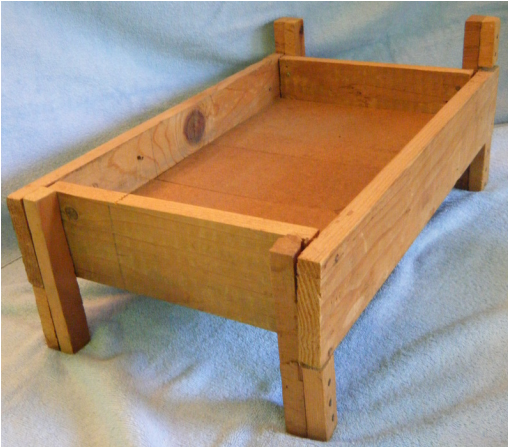 He built a "monkey bed" from scrap wood when he was 8 years old (this was before I was born). Artifacts that my brother made are few and far between. When I was older, he helped me build a plastic car model and taught me how to use spray paint. 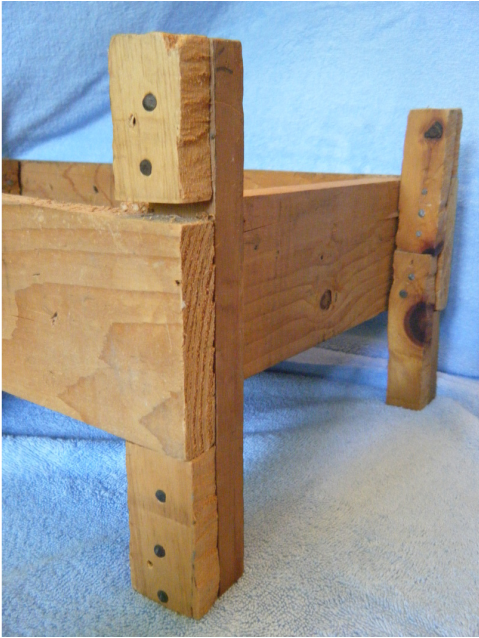 Bottom view of the monkey bed. 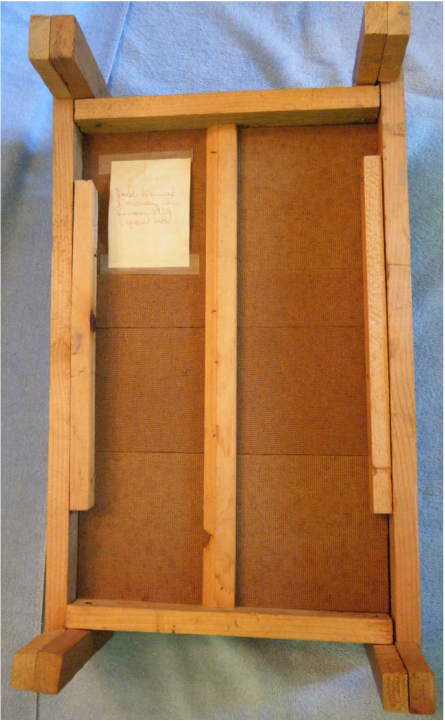 The construction is somewhat similar to a drawer. It is possible that he was inspired by my father when he built a full size workbench and a smaller one for children. The paper taped to the bottom is the historical information my mother recorded about the bed. It should prove useful to museum curators in the future. 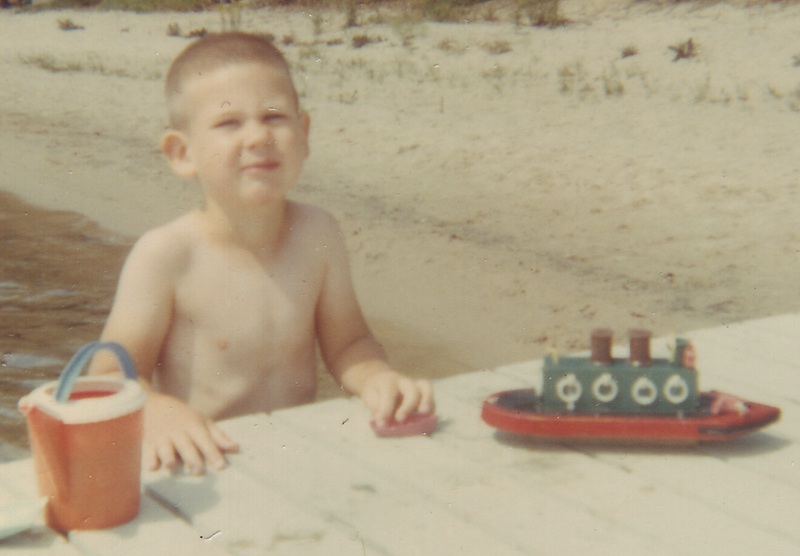 Perhaps my brother's most famous creation was Tuffy the Tugboat. Here I am on vacation at 3 1/2 years of age. Tuffy is made of scrap wood, spools, plastic curtain rings, as well as a plank, lanterns, steering wheel, and anchor scavenged from a once awesome toy sailing ship. I'm not sure where the rubber decking and bumper came from - possibly an old inner tube. I think every one of the 11 siblings played with Tuffy. Tuffy is now dry-docked on the cottage mantle. My brother must have used a hand saw for the uprights and done his own nailing. Top view of the monkey bed. The monkey is a modern Ty stand-in, the original sock monkeys felt this photo shoot might have been a trick to expose them to more limb or tail stretching on a structure that looks similar to the rack. The stained masonite bottom is not from scared monkeys or freshly chewed monkey tails - the attic where the monkey bed is stored must have a leak.